Robert Thomson and Tina Gaudoin Unveil WSJ. "I think that's the point at which you're all meant to clap." Tina Gaudoin, editor in chief of WSJ., stood on stage at the Morgan Library on East 36th this morning. She had just presented the first issue of The Wall Street Journal's luxury insert, which debuts in this Saturday's edition of the paper. The assembled crowd of journalists could be forgiven for not applauding as the cover and several pages of the magazine were revealed from beneath an awkwardly-draped scrim. They were too busy enjoying breakfast, which consisted parfait, cantaloupe with a sprig of mint, salmon filet, and a filo-crusted omelet topped with caviar. There were also miniature scones no bigger than silver dollars. News Corp. had even thoughtfully provided three types of juice—a juice flight!—beside each of the square plates. Ms. Gaudoin was introduced by Robert Thomson, managing editor of The Wall Street Journal and editor in chief of Dow Jones & Company, whose severe, imperious manner was lightened up by his joke that, Ms. Gaudoin was "the world's most talented, the world's best magazine editor of British origin called Tina." Looming on the stage, Mr. Thomson resembled Anton Ego from Ratatouille, but had a loose, jokey demeanor. One wondered how many members of the crowd couldn't stop thinking of Ludovic Seeley, the magazine editor imported from Australia to launch The Monitor in Claire Messud's The Emperor's Children. Mr. Thomson boasted that "The eschatological angst that characterizes much of the newspaper industry does not define Dow Jones. You'll see when the next round of circulation figures are released just how robust, how rosy our sales are." After rattling off figures and stats—they're adding bureaus overseas! creating a news hub online! their digital audience is up "92% year-on-year"!—he said, "We are being inundated by journalists from around the world who can sense that we are pursuing a journalistic agenda, a quality agenda, an agenda of objectivity. We don't have the fetid air of failure at Dow Jones." WSJ., which is oversized ("the largest magazine that would actually fit within the fold of the newspaper," Ms. Gaudoin explained) will begin as a quarterly and go monthly next year, according to Mr. Thomson, and ship 800,000 copies in the U.S. and 160,000 in Europe and Asia. There would be 51 advertisers in the first issue. "We wanted to produce more than a catalog of things to buy," Ms. Gaudoin told the crowd as a young woman mowed the library's lawn on 36th Street outside the window right behind her. "We wanted to respect the audience's respect for money." That audience, according to Michael F. Rooney, The Wall Street Journal's chief revenue officer, "Are smart, inquisitive, discerning, and vocal... 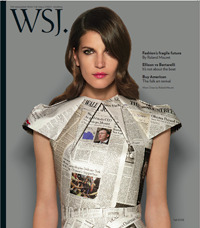 Compared with the already off-the-chart demos of the newspaper, the audience receiving WSJ. have even greater wealth, higher income, and take more than twice as many international leisure trips... You could call it the ultimate circulation." Mr. Rooney cited an average per-household income of $265,000 and average household assets of $2.9 million. A murmur could be heard from the assembled press at that point; the catering staff continued refilling coffee cups. After the presentation and a short question-and-answer session that leaned heavily towards international press—Mr. Thomson even got to show off his Mandarin skills with a reporter from China's Tsing Tao Daily—reporters finally got their hands on a copy of the magazine. In a lucky break—noted yesterday by Jeff Bercovici on Portfolio—it contained a story on presumptive Republican Vice Presidential candidate Sarah Palin. There are also stories on dog couture, face creams, and cruises. Who will read the magazine? It's a good question. In March, one journalist wrote a story in which he looked at the glut of high-end luxury magazines on the market and asked, "how many Americans are worth that much? Maybe 50,000 at most? Surely not enough to support 20 new luxury magazines and all the mass-luxury companies that fund them. And you can bet many of those rich folks are losing more than 5% of their portfolios. When you lose $20 million from your $100 million portfolio, you can still afford that new Bentley, but you’re probably not in the mood to buy it." That writer? The Wall Street Journal's Wealth Report blogger Robert Frank.